In 1935 L.B. 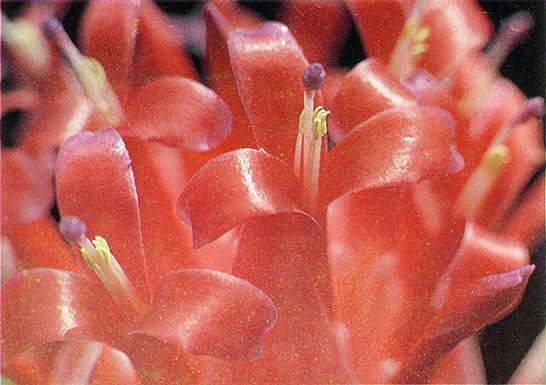 SMITH established the new bromeliad genus Mezobromelia (Proc. Americ. Acad. 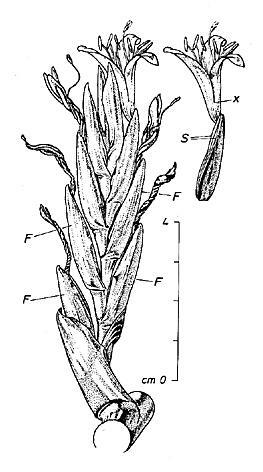 70, 1935, page 71) and separated it from the closely related genus Guzmania by the following characteristics: The petals of the polystichous arranged flowers are united to a long tube, much exceeding the sepals, bearing near their bases two ligulae. The filaments of the stamens are attached to the petals up to their free lobes (fig. 1). Since the establishment of the new genus the diagnosis must be changed, insofar that the flowers are not only polystichous, but also arranged in 2 ranks. The type of the genus is the Colombian Mezobromelia bicolor L.B. SMITH, which Killip (Coll. No. 11396, 1922) collected in an altitude between 2100-2400 m near La Cumbre in the Prov. Valle. In comparison with the other known species M. bicolor is a small plant of about 50 cm high, and the bright-red primary bracts enfold the short stipitated, ellipsoideous spikes, which have 3 to 5 polystichous arranged yellow flowers (fig. 1). The petals are highly connated and show near the base 2 ligulae (fig. 1). The plant seems to be known only from the type locality. Right: flowering plant with an offshoot. In 1948 L.B. SMITH (Lloydia, Vol. 11, No. 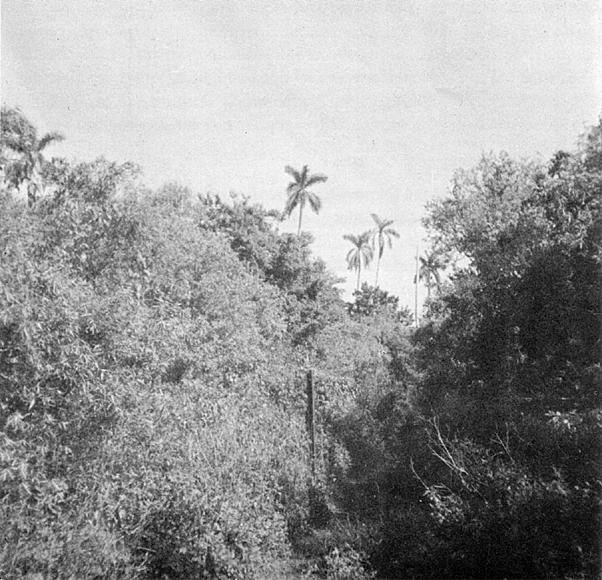 4, page 303-303) described a second species, M. fulgens, which is closely related to the south Colombian Guzmania candelabrum, but it differs from it by the above cited characteristics. M. fulgens was discovered by J. STEYERMARK (Coll. No. 54430, 1943) on the Páramo between Tambo Cachiyaca, La Entrada and the Nudo de Sabinillas in southern Ecuador (Prov. Zamora). 1961 DODSON and THIEN (Coll. No. 675) collected the same species at km 14 along the road Loja-Zamora in an altitude of 2800 m near the type locality. In September 1973 RAUH and BARTHLOTT (Coll. No. 35190) had the chance to find M. fulgens in the same place in full flower. They stated that it grows as well as a terrestrial (fig. 2) on the Páramo, as an epiphyte in the upper region of the cloud forest. As the original description of L.B. SMITH was made with incomplete material we now can correct it in some points and can also give remarks as to the ecology of this remarkable plant. M. fulgens is a very big Tillandsioideae. When flowering it can reach a height of about 3 m and more (the epiphytic growing specimen however becomes only 1,5m high). The numerous leaves form a big, short-stemmed rosette of a diameter up to 1,3 m and a height up to 1,5 m (fig. 3). The tank is filled up with a large quantity of water, in which big cushions of mosses settle (fig. 4). The sheathes of the leaves are inconspicuous, up to 30 cm long and 15 cm wide, on the upper side light leather brown, beneath dark castaneous brown lepidote; the lingulate, acute blades are up to 90 cm long and 10 cm wide (above the sheath), on the upper side sparsely, beneath denser lepidote (the trichomes are arranged in rows). 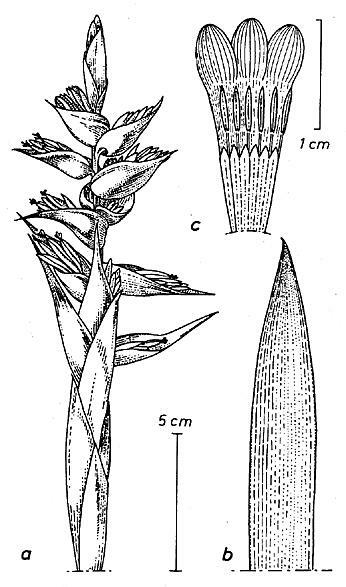 The thick, erect, glabrous inflorescence-scape is about 80-100 m long; the scape-bracts are densely imbricate; the basal-ones subfoliate, the upper ones have a long sheath and short recurved blade. The inflorescence is 1-2 m high, pyramidal, at the base 40 cm wide, 3- to 4-pinnate with a thick, glabrous, carmine-red rhachis (fig. 5, the branches are horizontal to spreading. The primary bracts longer than the spikes; at anthesis they turn secund, are short stipitate, up to 6cm long; their rhachis is thin, flexuous, carmine-red. Flowers 4-5, before anthesis distichous arranged, after anthesis turning secund and polystichous, up to 6 cm long. Floral bracts dark purple, up to 22 mm long and 22 mm wide, ecarinate, glabrous, exserted by the ecarinate sepals. Petals yellow-greenish, about 6 cm long, up to 4 cm connate, in the upper third recurved (fig. 6), near the base with 2 dentated ligules. Stamens and style included. Above: tank filled up with cushion of moss, which is shown in the left figure. Fig. 5 Mezobromelia fulgens in habitat at 2700 m.
Mezobromelia fulgens, known up to-day only from the type locality, grows as well in the cold, humid misty, windblown páramo (2800m) as in the cloud forest. 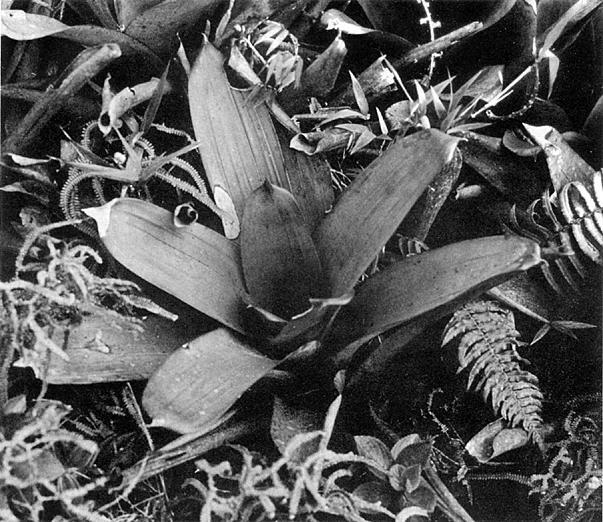 On the páramo M. fulgens is a plant of a low scrub of Chusquea (Bambusee), of Melastomacea, ferns and others and sometimes associated with Aechmea mulfordii and a very long-stemmed Guzmania, which could not be determined because of a lack of young or old inflorescences. All drawings and photos by author. In the cloud forest, where Mezobromelia grows as an epiphyte it is much smaller (only up to 1,5 m high) and associated with such Tillandsiodeae as T. tetrantha var. tetrantha and the beautiful dwarf Tillandsia seemannii with big bright red floral bracts. All these mentioned bromeliads are—according to the special ecological conditions (cold, mist, high humidity)—very difficult in cultivation, at least in Europe. M. bicolor and M. fulgens were up to today the only known species of the genus and their localities are separated by a long distance. 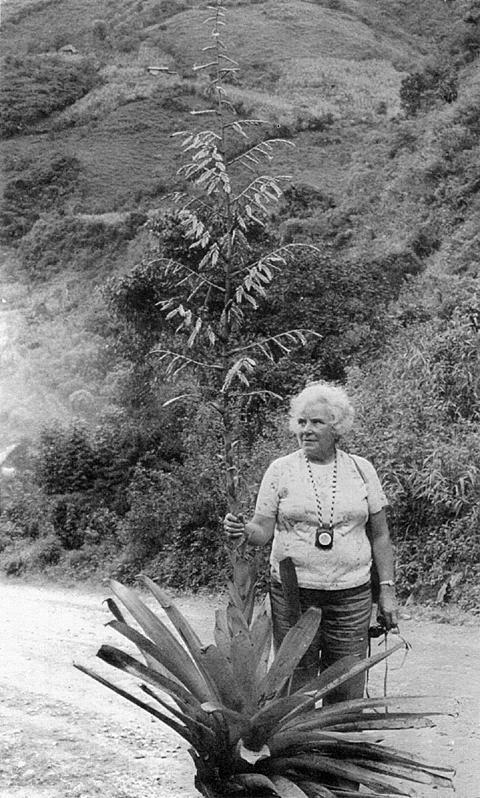 On our botanical trip to Ecuador in 1973 we (RAUH and BARTHLOTT) found on the old Quito-road from Quevedo to Latagunca (Prov. Cotopaxi) in a degraded cloud forest (1800-2000m) a very big (3 m high) plant, growing epiphytically, resembling a great Vriesea (fig. 8, fig. 7), but the analysis of the flower structure showed that our plant (Coll. No. 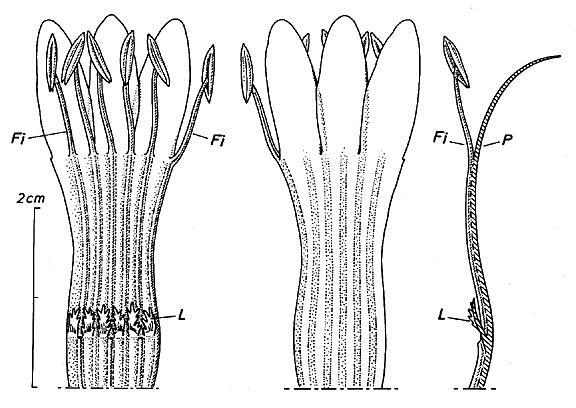 34477) is a new Mezobromelia: The petals are united to a tube, exceeding the sepals and have two ligules at the base (fig. 9 and 10); the only difference to the original diagnosis of the genus is the fact that the flowers are strongly arranged in 2 ranks (fig. 9), but we could observe that in M. fulgens the flowers are also arranged in 2 ranks before anthesis. In honor of his enormous accomplishments in bromeliad research this beautiful plant is dedicated to Lyman B. SMITH from the Smithsonian Institution and shall be described as Mezobromelia lyman-smithii RAUH BARTHLOTT nov. spec.1. Plant stemless, flowering up to 3 m high (fig. 7). Leaves numerous, forming a big rosette of 1,3 m in diameter (fig. 8). Sheathes broad-ovate, up to 25 cm long and 18 cm wide, on both sides dark castaneous brown lepidote. Blades lingulate, acute, up to 60 cm long, above the sheath 13 cm wide, green with purple spots, glabrous on the upper side sparsely appressed lepidote. Scape erect, ca. 110 cm high, 3 cm thick (fig. 7), glabrous, green to carmine-red. Scape bracts imbricate, longer than the internodes; the basal ones subfoliate, with long, carmine-red sheathes and green recurved, beneath scarcely lepidote blades. Inflorescence very laxly, amply tripinnate, pyramidal, 1,5 - 2 m long and 70 cm wide at the base (fig. 7) with a carmine-red glabrous rhachis. Primary bracts shorter than the sterile bases of the primary branches (fig. 7), with long carmine-red sheathes and short, recurved, beneath scarcely lepidote blades. Branches spreading-ascending (fig. 7), the lower ones up to 35 cm long (including the terminal spike) with a thin, bright-carmine axis and a sterile, foliaged base. Spikes at the anthesis all hanging downwards (fig. 7, fig. 8), short stipitate (1-2 cm), up to 10 cm long and 2 cm wide (fig. 9) with a flexuous, laterally applanated, carmine-red axis. Flowers praefloral dense, imbricate, at anthesis loosely arranged and rhachis visible, distichous (fig. 9). Floral bracts ecarinate, towards the acute tips slightly carinate, up to 2,5 cm long, fresh even, dried nerved, on the upper side scarcely lepidote, exceeding the sepals, carmine-red at the base and pale yellow at the tips. Sepals up to 2,3 cm long, acute, the posterior scarcely carinate, up to 4 mm connate. Petals pale yellow, 3,5 - 4,5 cm long, united to a tube of 3 cm length (fig. 9); the free lobes recurved, lingulate, obtuse, with 2 dentated lobes at the base (fig. 10). Stamens shorter than the petals, their filaments mostly united with the petals. Style as long as the petals (fig. 9). Holotype: Coll. No. RAUH et BARTHLOTT 34477 (4.8.73) Herb. of the Institute of Systematic Botany of the University of Heidelberg. This decorative plant is known up to today only from the type-locality, where it grows epiphytically. The discovery of M. lyman-smithii now has closed the hiatus in the distribution area of the genus between the Colombian species M. bicolor and the south Ecuadorian species M. fulgens. 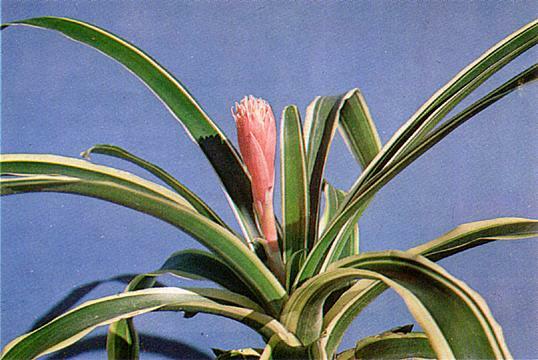 The author is convinced that in future field research more Mezobromelia species will be found. Bromeliad study groups appear to be springing up all over the United States. The latest to be affiliated is the Long Beach — Lakewood Bromeliad Study Group in Southern California. President is Mrs. Kathy Dorr. For further information contact her at 6153 Hayter Ave., Lakewood, California 90712. 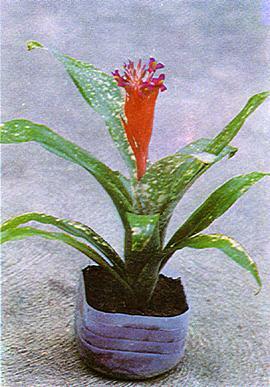 For those growers who are isolated insofar as growing bromeliads is concerned, there is a Bromeliad Round Robin. For information write Mrs. Velva Jane Watson, 8615 Jackson Springs Road, Tampa, Florida 33615. Erratum: Readers are asked to turn to page 67 in Issue No. 2 for this year and on the top line change the word tablespoon to tablet. The old quarter of New Orleans, surrounded by the spreading modern city, has surprisingly retained quite a number of its original brick and cypress buildings and its colonial Franco-Spanish atmosphere. As the city outgrew this old area, the section gradually became a deplorable slum, but in recent years the State of Louisiana and the City of New Orleans have taken steps to give the old quarter a special status, and new people, charmed with the unique character of the surroundings, have come in and set about preserving and restoring some of the old houses. One of the delightful features of these old dwellings is the private courtyard most of them have. The buildings themselves come right up to the sidewalk. In the rear, and surrounded by brick walls, is the patio, shared alike in the old days by the white family and their African domestic servants. The latter lived in a building in the rear, the lower floor of which served as a kitchen for the household. Nowadays, these houses are usually divided into several apartments with a common use of the courtyard, and many lovers of plants have created interesting gardens subject to the very special conditions that a patio with high walls imposes on the gardener. New Orleans and most of its suburbs are built on drained marshland. Much of the area is even below sea level. Consequently all rainfall is channeled to pumping plants which force the water into Lake Pontchartrain, the large sea-level body of water on the city's north side. This artificially drained land protected from sea tides and Mississippi River floods by substantial dikes, is costly to maintain and relatively expensive, tending to make individual homesites small. Gardens and patios are correspondingly small. In these limited enclosures, the vertical garden, such as suits the epiphytic nature of most bromeliads and air plants in general is not uncommon. Plants in pots, on slabs of cork bark, tree fern, or on driftwood are fastened to the walls and fences. The climate, being warm and humid for the most part, provides conditions usually suitable for most bromeliads in the spring, summer, and fall. The normally mild winters are more of a problem, however, for almost without warning the temperature may fall to a point that seriously damages, and sometimes even kills outright, all but the very hardiest of bromeliads. This may not happen for several winters; then again it may happen several times in a single winter. Another serious problem is the matter of sun and shade in the courtyard. The high walls exclude the bland early morning and late evening sun, but they furnish no protection to the plants when the noon day sun beats down on them. Damage is most apt to occur in summer when the sun suddenly emerges from a thunder cloud after a steamy shower. Its rays easily scald the leaves of susceptible bromeliads such as Aechmea fulgens. Shading is accomplished by placing the plants under overhanging galleries, which are common in these patios or under trees where they can receive filtered light. The hardier and more stoloniferous bromeliads—and there are quite a few that can be used—are often planted so as to ascend into the branches of the garden tree by way of its trunk. Often pots of bromeliads are nested in pebbles, redwood, or pine bark fragments, etc., in raised beds at the base of walls. In winter, when the sun traverses the southern sky, the high walls are apt to exclude too much sunlight at a season when it is most needed, so these pots of bromeliads are shifted to the side of the courtyard receiving the maximum light. Bromeliad enthusiasts continue to increase in number in the New Orleans area. With the formation of the MORRIS HENRY HOBBS BROMELIAD ASSOCIATION, the New Orleans area can now boast of five separate groups. There are seven in the state. This new group is named for the late Morris Henry Hobbs, nationally known artist, who, with Eric Knobloch, was instrumental in introducing bromeliads to south Louisiana. It was he, aided and abetted by Mr. Knobloch, who formed the original Louisiana Bromeliad Society in February 1954. Mr. Hobbs had won national recognition for his etchings and the contributions he made to the art and technique of etching. His works adorn many homes in New Orleans. For five years, starting with Issue No. 1 for 1959, he drew the covers for the then Bulletin of the Bromeliad Society. His original drawings of bulletin covers and paintings of bromeliads are prized possessions of quite a few Orleanians. There are fifty-five members in the MHH Bromeliad Association, most of whom are new to bromeliads so the programs are inclined to the novice. Officers of the new group are Irwin Poche, Jr., President; Buford Pippin, Vice-President; Charlotte Robinson, Recording Secretary; Lawrence Williams, Corresponding Secretary; and James Ballard, Treasurer. Interested persons should write 5635 Charlotte Drive, New Orleans, for information about the meetings. STEPHEN D. MULLINS, JR., M. D.
At least one of the programs at the monthly meetings of the Florida West Coast Bromeliad Society is each year directed to "Problem Plants." This year the first meeting after the summer vacation had this topic as its theme, and the summer had indeed produced a bumper crop of problem plants. Poor, wilted, rotted, over fed, under fed, bedraggled, diseased specimens were presented by humbled growers seeking sympathy and encouragement to go out again and sin no more. 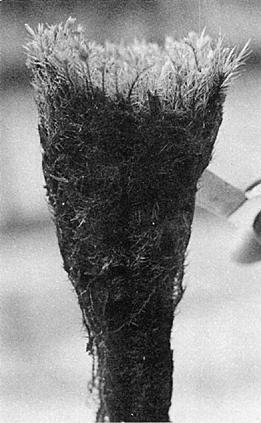 Perhaps the most common problem was that of crown rot from excess humidity and rainfall with poor drainage in the potting technique. Florida's summers are high in humidity along the coast and some forty inches of our annual sixty inches of rain occur in the three summer months. Unless the crown and root drainage is excellent, here comes the "Brown Death" of fungus. A specimen of Neoregelia carolinae var. tricolor was one of the "sick and wounded" that attracted much clucking, head shaking, and hesitant diagnoses. Almost each member admitted that he had seen some appearance of a similar condition in a few of his plants, but no one had a certain diagnosis and treatment. Most of the plants that were noted to be affected were neoregelias. Most had recovered, but were permanently scarred. For members in other areas that might have similar problems, I believe that it is now (some two months later) apparent that the problem resulted from physical injury from excess sun that was reflected from our white house and excess dryness from being under the house overhang. This plant was moved into some cool, green shrubs, given a daily sprinkle, and some gentle talks of encouragement about "How much better you are looking!" Now, new and totally green leaves have appeared, and the old, scarred patches are hidden under a fresh upper rosette of healthy leaves. Editor's note: I have had similar experience with a number of diversified species: Vriesea hieroglyphica, Tillandsia violacea, and Aechmea lueddemanniana variegata are but a few. I thought I had ideal conditions for all three plants, but something happened to the emerging leaves still deep in the heart so that each plant had a ring of brown discoloration. Something evidently fell into the heart of the plant to injure the new leaves. As I noticed this brown ring in early spring, the injury evidently had occurred during the winter months, when wet, cold nights occur, and the harm might have been caused by a sudden drop in temperature. I did nothing to the plants but wash out the hearts and left them in the same situation. Now they seem to be husky, healthy, even though a little marred, plants, and the aechmea is busy putting out offshoots. On the opposite page are pictured two of the newest bromeliad hybrids to be registered with the Society. Both appear to be outstanding plants. Vriesea 'Po Boy' is a hybrid of the late Ralph Davis, enthusiastic bromeliad grower and propagator of Miami, Florida, who made the cross in 1970 using V. simplex var. rubra as the seed parent and V. ensiformis var. ensiformis as the pollen plant. Mr. Davis unhappily did not live to see the plant put out its first inflorescence in 1974, and it was named by his widow, who used an expression popular with her husband. V. 'Po Boy' is a lovely medium-sized plant, displaying the best features of both parents. We must thank Robert G. Burstrom for registering this cross. It is our understanding that Mr. Davis made a number of outstanding hybrids, many of which are grown in southern Florida but which are unknown in other parts of this country. It is our sincere hope that Mr. Burstrom, who is on the Board of Directors of the Bromeliad Society, will oversee the registration of all of Ralph Davis' fine hybrids, so that others may know and appreciate his many endeavors in this field. 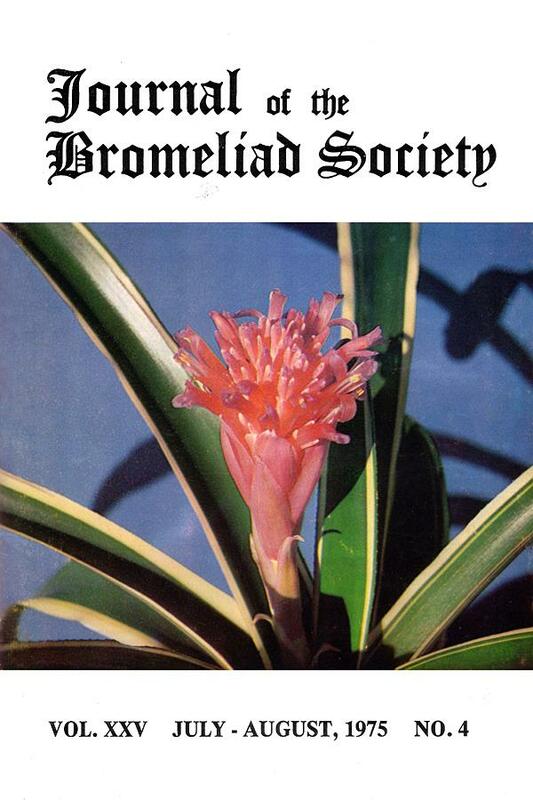 Bromeliad catalogues, both here and abroad (Europe, Australia, etc. ), every year are listing more and more hybrids, all of which have highly suggestive names. Although many of these plants are very fine and are worthy of a place in collections, they would be more valuable if their parentage were known, as well as the name of the person responsible for the hybridization. This office is constantly getting inquiries regarding the heritage of a certain cross about which nothing is known. Unfortunately, we have no way of running down the parentage of these plants if the hybridist prefers to remain unknown. Stretching northeast and southwest across Big Cypress Swamp in Collier County, Florida, is Fakahatchee Strand (slough). Joined on the northeast by Okaloacoochee Strand, these two areas together produce a continuous wet region, which varies from 5 to 12 miles wide and is over 45 miles long. The slow moving water in this long trough varies from no surface water (it is underground) to water over waist deep according to the time of the year. This water moves very slowly toward the Gulf of Mexico and empties into the Ten Thousand Islands area at Fakahatchee Bay just inside Monroe County, Florida. 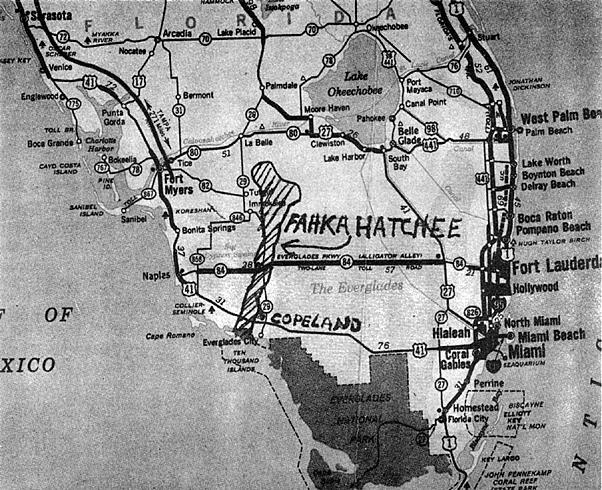 Fakahatchee is a Seminole Indian word pronounced Fak-a-hatch-ee. In this densely covered area you will find, about 12 miles north of the village of Copeland, the only living stand of native American Royal Palms. These palms alone are worth a visit. Also abounding in the perennially wet area are many orchid varieties, as well as an abundance of ferns, many as high as your head. Fakahatchee is strictly for the walker, as there is no way any mechanical apparatus can take you through much of it. It was in here that the late Ralph Davis came upon the variegated variety of Guzmania monostachia. Also found here in profusion are Guzmania monostachia, Catopsis floribunda, and Tillandsias fasciculata, utriculata, valenzuelana, setacea, pruinosa, balbisiana, recurvata, usneoides, and polystachia. Less than five miles west of Fakahatchee's western edge on higher ground are also found C. berteroniana, T. flexuosa, and T. circinnata. Orchids and bromeliads in this area seem to grow together with exceptional results as you can see from a visit here. Around the turn of the century and into the thirty's an extensive logging operation was carried out in Fakahatchee, and thousands of huge cypress trees were felled for their lumber. However the rugged area was probably too much even for the giant cutting digging machines, and a number of the giant cypress still remain. Large ditches were dug through the treed areas and the dirt was thrown up to make road grades so that small engines on rails could haul the logs out to the saw mill at Copeland to the south. There are many tales about the wild creatures that inhabit the Florida swamp, but they are just that—tales. I have made many trips into this area with a friend and many times with my wife and two children, whose ages are 9 and 5. It is always a thrill to see a deer, an otter, or a racoon, but the danger, if it is there, never seems to come out from behind the trees. Oh yes, we have been annoyed a few times by mosquitoes, but a little repellent will drive this seldom-seen pest away. It is indeed well worth anyone's time to walk into Fakahatchee and see all the bromeliads in their natural surroundings. Take US 41 down to Naples, Florida, and then follow US 41 east toward Miami. About 45 miles east of Naples, you will come to Florida State Road 29. Turn north on it for about 2 miles, and you will reach Copeland, a former lumber town, where a now defunct railroad used to carry the cypress lumber north to Yankeeland. Take the gravel road north of Copeland for about 12 miles, and when you see the giant Royal Palms around you, it is time to park your car and start exploring. You are now in Fakahatchee Strand, my friend, and surrounded by millions of bromeliads and other exciting plants. In closing, I may add that bird lovers will get a thrill out of Fakahatchee, but my greatest thrill was the utter silence and tranquility. Boy, it was out of this world! For the past 15 years I have been raising and learning about bromeliads. Many are excellent house plants since they adapt to our conditions, but there are others which must have an environment like the one where the plant was found in the wild. In our southern California gardens many robust broms flourish. These are the hard-leaf varieties of aechmeas, bromeliads, porteas, dyckias, hechtias, and neoregelias. Those which hold water between the leaves form a habitat for frogs and insects. In favorable spots the epiphytic broms may be grouped into tree gardens forming "treetop swamps." Some broms, such as cryptanthus, make lovely accents in terrariums. Wherever we use bromeliads we must remember their species needs: good drainage at the roots, good air movement around the plants and enough good light to bring out the color in the leaves and inflorescences. Those broms which are good house plants are not demanding. They will grow well in shade and the dry air of our homes. A tray of pebbles and water placed below the pots give the humidity that is required. Vrieseas, guzmanias, thin-leafed and bicolored aechmeas are most often chosen for accents. Neoregelias in bloom are spectacular on a low table, since we must look down at the center to see the bloom. I am often asked about feeding broms. This is not an easy question to answer. If bromeliads are grown outdoors in the ground, no feeding is necessary. When we remove them to a greenhouse or living room we must replace the food they would get from wind-blown dust and bird or insect droppings. My first greenhouse was a plastic lean-to without a door. A pet dove sometimes roosted inside, and the plants thrived on the fertilizer thus provided. I prefer to feed broms at the roots in the soil mix with a fertilizer that is high in phosphorous to encourage bloom. If possible, water with rain water. There are several slow-release fertilizers now available in different formulas. I find a slow-release or timed release food cuts down on the care of my plants considerably. If the planting is a bromeliad tree or other epiphytic arrangement, I use a very dilute solution, one-fourth to one-half strength, of an acid type house plant fertilizer or fish emulsion once or twice a month during active growth. NEOREGELIA ampullacea varieties, carolinae, princeps, sarmentosa, zonata. TILLANDSIA bulbosa, butzii, cyanea, lindenii, ionantha, usneoides. By all means, once your interest is aroused, contact other growers for discussion and learning by joining an affiliated group in your locality, joining a Bromeliad Round Robin, or by getting in touch with other members of the Society. Everywhere one turns these days, it seems there are more and more variegated forms of bromeliads—Neoregelia marmorata, Neoregelia concentrica, Nidularium billbergioides, Aechmea nudicaulis, Aechmea fulgens, Vriesea splendens are the first to come to mind. A member recently wrote that he had over fifty variegated forms of bromeliads. What causes an otherwise plain-leaved plant to produce offspring that are variegated or that are different from their parents? When David Barry wrote his "Comment on Viruses in Bromeliads" in the Bromeliad Society Journal, Issue No. 4 for 1972, he started a controversy which resulted in a number of articles written in reply to his contention that variegation in bromeliads is caused by virus. In general, the consensus was that although a virus might be a cause of variegation in some bromeliads, the dominant factor was a change in the cells that produce chlorophyll. In this I would have to concur. After all, a virus is a disease, and as such is generally contagious. The example that immediately comes to mind is that of the variegated form of abutilon, which is a virus-ridden plant. When it is placed next to a plain-leaved variety, the virus tends to spread to the other plant, and in turn it becomes infected and produces variegated foliage. Usually, abutilons are husky plants, but the variegated form (A. striatum thompsonii) in my garden has been less rugged, tending to scale and die-back. While it is true that some variegated varieties of bromeliads are less robust than their green counter parts (Ae. 'Foster's Favorite Favorite' and Ae. orlandiana 'Ensign', for instance), most seem to be extremely hardy and are tolerant of the adverse conditions found in my yard. Such plants are the variegated forms of Ae. caudata, Ae. fasciata, Ae. lindenii, Ae. nudicaulis, and Neoregelia carolinae var. tricolor. It would be hard to believe that these healthy plants are virus infected, and from my reading on the subject I have come to the conclusion that such variegation is due to some deviation in the genes, those factors or determiners which govern the appearance of a plant. Genes seem to be rather mysterious things, as it would appear that they have never been seen, although, according to botanists, the evidence of their existence and their situation leaves little room for doubt. Genes seem to be remarkably constant, but when for some reason (injury, weather, a chemical, lack of proper nutrition, etc.,) a gene changes or is lacking, the development of the plant will follow a different course. When the gene undergoes some kind of change in that region of the plant where division of cells is continually taking place (called a meristem), then all the cells which develop from that wayward cell will have the changed gene. For example, if such a gene is one of those which are involved in the formation of chlorophyll, the process of manufacturing green coloration may be interfered with, and the leaves may turn out to have white or yellow stripes or margins. Such variations can be perpetuated as long as we use the parts thus affected in the production of each new generation. The variegated form of Guzmania monostachia that is found in a certain part of Florida often has the striping on one side of the plant only. Offsets taken from the variegated part will be variegated, whereas those taken from the section where the leaves are plain green will show no striping. The bards of ancient Greece told of a mythical creature called a "chimera," or "she-goat." This strange monster had the head of a lion, the body of a wild goat, and the tail of a dragon. Today botanists apply the name of chimera to any plant or animal which contains on one body tissues which differ genetically—in other words, is a freak. The variegated bromeliads which we treasure so highly would fall into the class of being chimeras, or in other words—freaks. Some variegation, however, is due not so much to the change in one cell as to the behavior of one gene or group of genes which is present in all the cells but acts in different ways in different cells. This type of thing causes patterns of color, for instances, blotches of color in a flower. 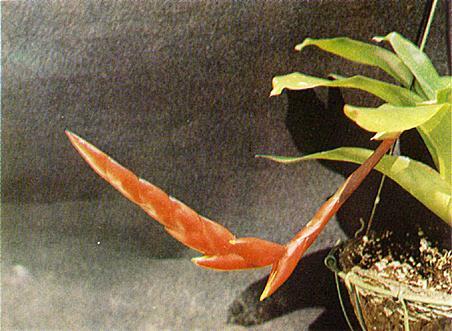 Perhaps, the red striping in Aechmea 'Red Ribbon' is due to this genetic behavior. Plants with this type of variegation are not chimeras. Botanists all agree that we know little as yet about genes, except that they are wonderful things. It would be a great help to bromeliad growers if some botanists could study their role in the fancy-leaved bromeliads. There are still many, many questions to be answered. Chimeras may be brought about artificially, so perhaps with more experimentation with meristem or tissue culture, we may be able to increase the availability of many of the hard-to-get variegated forms. Before going to Brazil our interest in bromeliads was focused on the epiphytic types. From a decorative standpoint and because of their interesting way of life, we found them completely fascinating. The epiphytic types were found in the rain forests all along the coastal areas where it is high and cool at night yet warm during the day, where frequent rains or heavy dew supplied their water. The trees were laden with a dazzling profusion of bromeliads and other epiphytes making unique pattern and design everywhere in the lush jungle. We expected to find the epiphytes wherever there were moist areas. A ravine, a stream, or a swamp seemed to be the very choicest spot for them. But one of the greatest surprises and disappointments came when we collected in the huge swamp areas of Matto Grosso. We had come by train from eastern Brazil to the far west, where the Rio Paraguay cuts through South America's largest swamp. Up the river we had traveled for miles and had seen countless thousands of trees, but they were barren of bromeliads. Only where there is an elevation will be found trees and rocks that may harbor a few epiphytes. If a similar swamp area occurred near the great jungles on the coast it would be a paradise for the epiphytes, as well as for the collectors who enjoy finding them. The high plains between the vast swamp area and the jungles of the coast section have been the "Green Hell" barrier that these moisture-loving plants could not cross. A few Tillandsias that disperse by means of wind-blown plumose seeds have flown over those dry areas, and a few drought-resisting tubular types of Billbergias and Aechmeas have also come most of the way. It would be interesting to go back there a few thousand years hence to see what descendants will be developed from some of these pioneers, for certainly the migration to this, geologically speaking, young territory will produce interesting new species. In the great primeval forest at the Cacao Experiment Station in Agua Preta, Bahia, we found a lush jungle garden, a plant paradise for eager collectors. Great masses of climbing begonias startled us, Philodendrons of fantastic shapes and design blended in an ornate pattern with Calatheas and Tradescantias of fancy foliage, and ferns crowded every available opening on trees, rocks, and ground. Many areas were almost impossible to walk through. If we were not being tripped by stout cords of lianas, thorny leaves and treacherous small palms were always reminding us of the things on the ground and interfering with our more ethereal aspirations of looking for the epiphytic beauties above us. There in the "upper strata" we found two huge epiphytes, both new species. These plants, Aechmea conifera and Aechmea depressa, were giants among epiphytes. The flower head alone of Aechmea conifera weighed nearly 12 pounds and measured 18 inches in length, resembling a huge pine cone. This plant was reposing serenely and securely in the crotch of a limb over 80 feet from the ground. Secure it was until, with the assistance of three human "monkeys," we succeeded in loosening it from its aerial home and with ropes lowered it to earth. 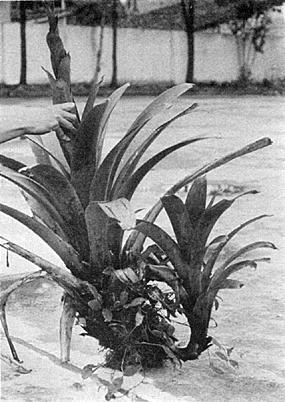 This epiphyte, including its several side shoots, weighed considerably over 125 pounds. From the ground this Aechmea did not greatly differ in appearance from Aechmea depressa, but the field glasses helped to convince me that it was another species. That meant another tough climb. To climb these huge trees one must resort to monkey tactics and not try to tackle first the tree he wishes to conquer. A small tree possibly 50 feet away may be the first one to climb, for its upper branches will intermesh with those of the larger tree. And so with the assistance of ropes and vines the climber finally reaches the lower branches of the giant tree and then all he has to do is to finish the climb and get the plant, which may be accomplished in another hour or two. But we forgot all about the difficulties of getting it when our thoughts turned to the perseverance and determination that a plant must have to be able to live perched at such a precarious height. With its huge reservoir to catch rain and vegetable matter it builds a body heavier than almost any of its terrestrial cousins, with the exception of some of the great Puyas of the high Andes. These great Aechmeas often hold from 1 to 3 gallons of water, which not only serves the plants themselves but also becomes a breeding place for animal life and even aquatic plants. Utricularias and aquatic mosses and algae are often found living in some species. In various specimens we found lizards, frogs, scorpions, small snakes, centipedes, various insect larvae, roaches, ants, and bees, some preferring a particular type of bromeliad. The frogs that find a permanent residence in the deep, dark cylinders and cups of the bromeliads interested us most, and we made a small collection of them for Dr. Lutz. She has stated that "bromeliads make frogs independent of climate and environment, by creating a special environment." In dry areas of Matto Grosso I found one of the biggest and most curious of the tree frogs, known as Hyla venulosa because of prominent veins in the eye. I had a hard time dislodging this one. It seemed to be stuck to the inside of the Billbergia zebrina where it was hibernating through a dry season. I shook and shook the plant but finally had to cut it open, and when I pulled the frog out of the little "canoe" of the bromeliad leaf, my fingers were all glued together. The frog had immediately thrown out his smoke screen, or rather, his rubber screen. When I touched him, a pure white latex oozed out of every pore of his body. I am very sorry now that we did not bring back a good supply of these frogs. In the later rubber famine we might have helped solve a national problem! The bromeliads apparently depend more on color to attract the fauna that act as an aid to pollinization than on perfume which in most flowers attracts the insects. Nectar gatherers that seem to have a special accord with bromeliads are the darting hummingbirds whose small, nimble bodies can get between the most complicated parts of a bromeliad flower and whose long, thin bills are especially adapted for efficient use in the tubular or deep-set flowers. Judging by the frequency of seeing hummingbirds at a brilliant bromeliad flower and also by the fact that hummingbirds would frequently hover around the red rain coat Mrs. Foster sometimes wore, I would say that they are attracted to the long tubes of bromeliad nectar more by color than by perfume. In Brazil they call these dainty little birds most appropriately "beija-flor," the flower kisser. The most familiar bromeliad is the terrestrial pineapple. Because of its delicious fruits, much desired by mankind, it has become a great globetrotter and now seems even to be most at home in the Hawaiian Islands far from its birthplace in Central and South America. Since the form of the pineapple plant is typical of that of other terrestrial bromeliads, the Bromeliaceae have become known as the "pineapple family." The pineapple type of foliage is common to many of the terrestrial genera. The more compact spiny types such as Deuterocohnia, Dyckia, and Encholirium resemble each other so much in foliage that unless flowers are present it is almost impossible to identify them correctly. Being semisucculent and very efficient xerophytes, these plants withstand almost incredible conditions. In certain sections these formidable terrestrial bromeliads grow in such profusion that it is almost impossible to climb the rocky slopes, for the plants are as well armed with spines as any cactus I know—in fact, they are often mistakenly called cacti. Many of these extreme drought-resisting species, like most of the cacti and other succulents, have endured adverse conditions for so many centuries that such conditions have become normal for them—adverse only from our point of view. They are conditions under which they thrive, and should the plant fall from a ledge or a tree to a moist, cool, shady spot, it would probably die. If it did not, its growth would be weak and abnormally fast. They have developed hardy qualities and are seldom found in the soft, shady places where the more tender ones such as Vriesias, Nidulariums, Neoregelias, or Billbergias seek cloister. 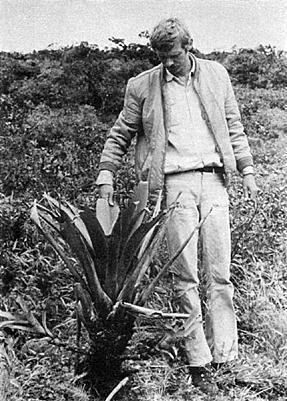 Dr. Smith believes that Puya is the most primitive bromeliad, and he is convincing in his argument against Mez's contention that the most primitive bromeliad is Navia. He suggests that probably Puyas came into being in the high Andes and that their offspring, meeting new situations, produced the various other genera. I, too, surmise that Puyas originated in the territory that is now the Andes, but I suggest that they came into being before the Andes rose to their present height, and that as the environment is presumably responsible for creating the various genera, they developed from ancestors that have since become extinct. But what about the genera, morphologically very close to Puya, that are now on the eastern edge of South America, such as Cottendorfia, Encholirium, or Prionophyllum now isolated on the Atlantic coast of Brazil? Finding primitive types of bromeliads so far from their "parents," the Puyas, seems to indicate that in early ages many of these genera perhaps did not evolve from the Puyas but developed simultaneously as a result of their environment. Encholirium, Lindmania, Deuterocohnia, and Cottendorfia are similar in construction to Puya, but that does not necessarily mean that they descended from Puya; they could have evolved from other ancestors now extinct. During the period of our two extensive trips into Brazil we collected in three extremes of country which produced the terrestrial species morphologically nearest to the primitive species of Puya. In the Matto Grosso on the Bolivian border we were as close to the "source" as our trip permitted. Rising out of the vast marshes in southern Matto Grosso was the strange mountain Urucum, 2,000 feet high and 75 percent manganese ore. Dry areas were always presenting themselves in unexpected places in Brazil, and this was one of them. Instead of the usual moist, humid forest on the mountainsides, we found a dry, dusty jungle of bamboos and dwarf trees through which for hours we hacked our way with sharp facao. It was here that we found Deuterocohnia Meziana, that unique bromeliad whose 5- to 7-foot flower stem continues to bloom for years from the same stalk. It grew as well on limestone rocks overhanging the Paraguay River as on the manganese rocks. Unlike most of the bromeliads, this plant is caulescent. I have seen overhanging the high rocky ledges specimens probably 50 years old, with large, ridged trunks that gave them the appearance of prostrate yuccas. In central Brazil, on the edge of the high plateau in the state of Minas Geraes, we found other terrestrials that were relatives of the pineapple and close to the primitive form of Puya. This is a section of mines—gold, iron, and diamond. In every direction we could see the effect of the vast deposits of ores in the soil, and at evening the purple haze, mingled with red and yellow glints from the sun, made a glowing spectacle radiating earth colors seldom seen outside of a mining district. It was in this section that Glaziou, the French botanist who spent the latter part of his life in Brazil, did considerable collecting. He was a bromeliad enthusiast, and in his years of collecting he discovered some 65 new species in this family, a greater number than any other collector had ever found. It was interesting to find many of his species, and in a number of cases our specimens were the first found since the type was named. It was a keen satisfaction to be able to collect two new Dyckias and three new Vriesias in the rather arid rocky areas of Minas Geraes (with promise of still other undescribed species in the material obtained). In most of these rocky areas one would expect to find cacti, as in Mexico, but in parts of Brazil most of the soil is acid, whereas the regions of Mexico in which cacti thrive are alkaline. So in Minas Geraes cacti were the exception rather than the rule. We seldom found bromeliads and cacti together. 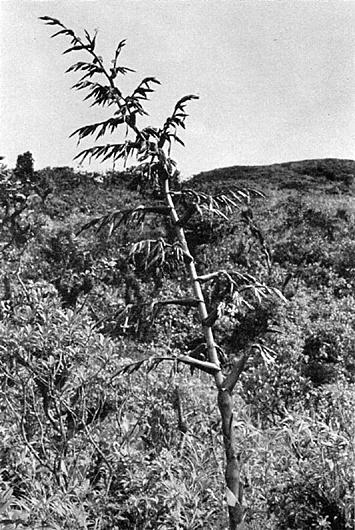 In southern Brazil our collecting was confined to Parana, where Dyckia encholirioides was typical of the primitive terrestrials near Puya. Unlike other Dyckias, it grew on bare granite rocks on the Atlantic coast at as low an altitude as 6 feet above sea level. Its species name indicates how close are the Dyckias and Encholiriums. Dyckia encholirioides is one of the few Dyckias that have developed a trunk 7 or 8 feet long. Most of the Dyckias increase by stolons or side shoots and form bed masses of plants. Clinging to the granite rocks in a similar position on the Atlantic coast, but much farther north in the state of Espirito Santo, we found a new Encholirium. This, too, had developed a prostrate trunk, and it might well have been named Encholirium dyckioides, but my description convinced Dr. Smith that the best name for the plant was Encholirium horridum, for my flesh was badly scratched and torn when I cut my way over a huge colony of these plants with their formidable, stiff masses of barbed leaves. This was the first species of Encholirium to show a branched inflorescence. It was the second new species in the genus for us, as we had discovered our first new one in Bahia and named it Encholirium Hoehneanum in honor of Dr. F. C. Hoehne of Sao Paulo. One of our trips took us into both dry and humid territory in Bahia, northern Brazil. Here was a wide range of conditions, varying from the hot sands of the sea coast, where we found our new Hohenbergia littoralis, to the dry caatinga similar to the mesquite lands of Mexico. In this dry, shadowless desert covered with thorny, harsh vegetation punctuated with a few tall cacti we found the new Cryptanthus bahianus. During our month there we added nine new species to the total from that state, including Cryptanthopsis navioides. Of this latter genus only one species had ever been collected, and that by Ule some 30 years ago. This interesting whorl of delicately spined, stiff, grasslike leaves grew in a moist ravine in extremely dry country, a habitat similar to that preferred by most species of Cryptanthus. Under the open, thorny vegetation we found another individualistic bromeliad, Neoglaziovia variegata. The dull, brown-green leaves of this plant with their vivid whitish bands look at first glance like snakes. In Brazil it is one of the most useful bromeliads, having been used by the Indians for centuries—and now on a commercial scale—as a source of excellent fiber which is stronger than sisal and makes a cloth that is softer than linen. The natives call the plant caroa or caraguata, names that are also used for several other kinds of terrestrial plants that yield fibers. I am convinced that the type of country tends to produce the change in plants that creates varieties and species, and certainly it is the adaptability of the bromeliads that has made the family so prolific. Plants with this quality, like people, go places and do things and make the best of a situation even if they have to change their color, habits, food, or methods of travel. Every hundred feet of elevation, and sometimes even every mile from the sea, one sees a change in the bromeliads. When soil conditions, rocks, precipitation, and air currents differ, the bromeliads which have adapted themselves to these changes will be different. It was especially interesting to observe the continually changing parade of species during the ascent of Mount Itatiaya, which is nearly 10,000 feet high. At every rise of a few hundred feet, new bromeliads would appear, and then gradually disappear as we reached higher plant strata. And yet one Vriesia and one Aechmea started with us near the bottom and stayed with us until we had almost reached the top. But as we passed the tree line, they were left behind, although they attempted to stick it out on the sides of some of the large boulders. At the top, the exposure to wind and cold was too great for them, and they relinquished the territory to the Fernseea itatiaiae, the range of which is restricted to this mountain top. It is the sole member of its genus and seems completely satisfied with its isolation. It withstands frost, sun, wind, and drought and requires only the modicum of food that can be obtained from small crevices or cracks in the boulders. Aechmea nudicaulis, on the other hand, has not been satisfied and has wandered all over the American Tropics. We found it in Mexico, Cuba, Trinidad, and Brazil; it is profuse in Central and South America. It lives in trees or on rocks in the coastal area and generally enjoys either sun or shade. With its range extending for thousands of miles, its plant form and its flower do not show as much variation as one would expect. On the shadowless sand dunes of the Atlantic coast in the state of Espirito Santo we found another Aechmea as yet not definitely determined but undoubtedly close to A. nudicaulis. It is a stiff, gray-brown, tubular plant, almost metallic in texture. It grew right up to within a few yards of the sandy beach. Almost by its side we found a new Portea with short, stiff 18-inch leaves. This same Portea we found again growing on mangrove trees in a swamp, just a few feet above the water. There its leaves were narrow, limp, and 6 feet long. The stiff Aechmea, however, refuses to grow rapidly no matter where you place it, and while it does change to a more greenish cast in color in certain locations, its growth still remains slow, stiff, and rough. An example of what happens to certain plants if the conditions are changed is found in Billbergia Meyeri, which I found in palm boots in harsh, dry country on the western border of Sao Paulo, where it was exposed to both extreme drought and torrential rains. We brought some of these plants back with us. Those that I kept in full light and gave no water retained their original shape; the plants kept in the shade made rapid growth and produced leaves three times their original length. When seeds of this species were planted, they germinated in 2 days; at the end of 4 weeks they were 6 inches high and ready to be placed in pots. At 3 months of age they were glabrous, succulent, green as grass, and showed no trace of resemblance (as most bromeliads do even at an earlier age) to the parent plant, which is a gray-brown, blotched plant with a texture like emery paper. Some of the species that have a wide range will vary so much in plant form, and at the same time have flowers so much alike, that they would exasperate almost any botanist. Again, there are many species, especially in the genus Vriesea, in which the plant forms appear to be almost identical, but which have entirely different flowers. I suspect that many botanists have passed by some of these more closely similar plants without realizing that there might be a new species among them. I have had one advantage over the botanist who collects only blooming of fruiting material. I take the living specimens as well as the herbarium material, and the plants coming to bloom at a later date in my greenhouse have given me fresh material to be studied before the process of drying destroys certain characteristics. They have also given me flower material which I would otherwise not have procured unless I had made another trip in some other season. From the hundreds of visitors who come to our Orchidario in Florida to see the plants we have gathered comes an almost universal exclamation: "It must be thrilling to go into the jungles and get all these wonderful plants! They see the romance only; we, too, see that romance as we look at the interesting flowers and plants. But we recall also other things that intensify the memories of tropical exploration—the bites of mosquitoes, carapatos, bichous, and giant ants, the stings of huge swarms of bees and wasps, the penetrating of areas where malaria, yellow fever, or Chagas' disease is prevalent, the difficulties of transportation, food, water, and shelter. And invariably the most beautiful flower is safely perched just beyond the point that is possible to reach. And not the least of these memories is the preparation of thousands of herbarium specimens. These specimens may have to be made from a 14-pound juicy flower head or from stiff, spiny leaves 9 feet long. They must be preserved regardless of the weather—in tropical rains and heat, or on cold, humid mountain tops. It is the surmounting of all these difficulties and conditions that produces the romance for our memory. But it is this part of the affair that would take most of the romance out of a jungle experience for many people, so they collect their jungle flowers from the florist. If you plan to raise bromeliads from seed, sow the seed as soon as you get it because the viability of bromeliad seed is rather short. Some seeds will lose their capability to germinate after a few weeks, whereas many will stay viable up to six months, and a very few even longer. How long does it take the seed to ripen within the fruit capsule? The answer is from three months to two years according to the respective species. If you harvest seed from your own plants, there are some rules to find out whether it is ripe before you make test-run for germinating ability. It is easy with tillandsias, for when the capsules open, the parachute-like seeds bulge outwards, asking to be taken before they fly away on their own. The ripeness of other bromeliad seeds is generally indicated by the color of the more or less round seeds. Most of them should be either brownish or dark brown or even black, but here are also a few exceptions to the rule. However, we need not be in doubt for too long whether the seed which we planted was ripe or not. Fresh tillandsia seed should germinate normally within 3 to 4 weeks, that is if we keep in mind that the act of germinating starts the moment when the seed begins to swell. But we should keep in mind that germination depends on the kind and age of the seed, the particular medium being used, time of year, temperature, light, humidity, or other circumstances which might be beneficial or unfavorable to the germinating process. Another suggestion is not to sow too densely, as you will have more seedlings than you can use and you are faced with the problem of what to do with the leftovers. The easiest way out is to give the seed to a friend, or even better, to the Society Seed Bank with the harvesting date and correct name correctly given on the packet. However, if you want to save the seed for a second try, keep in mind that you are dealing with "living matter", that seed is a breathing thing. Consequently, do not store it in closed plastic bags or in little closed jars, as seed needs fresh air movement, just as we do. Open glass containers, which are labeled, are best. 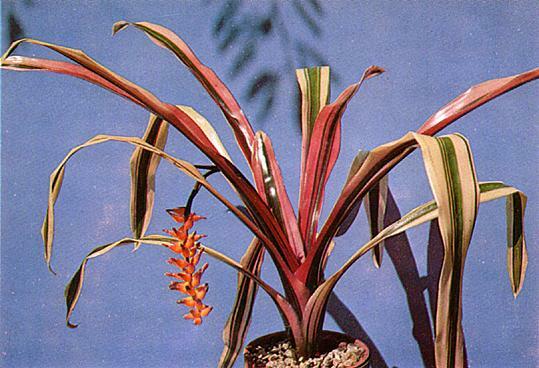 Although Billbergia pyramidalis has been in cultivation the longest of any member of the genus, having been introduced into Europe from southern Brazil in 1815, it has never ceased to be a favorite with growers despite the fact that its bloom is short lived, seldom exceeding two weeks. It is a popular garden subject in California and Florida, where it grows and multiplies with little or no care. There are several varieties of this plant: In var. pyramidalis, the sepals are red and the flowers are red tipped with iridescent blue. Var. concolor differs from the type plant in that its petals are entirely red. There are two forms of this plant: one blooms in late summer, the other in midwinter. Var. striata is a variegated form with longitudinal stripes of blue green and ivory. The newest variety is that pictured on the cover and on page 144 called var. Kyoto. This is an exceptionally handsome plant with two-foot long shiny dark green foliage that is edged with vivid white. 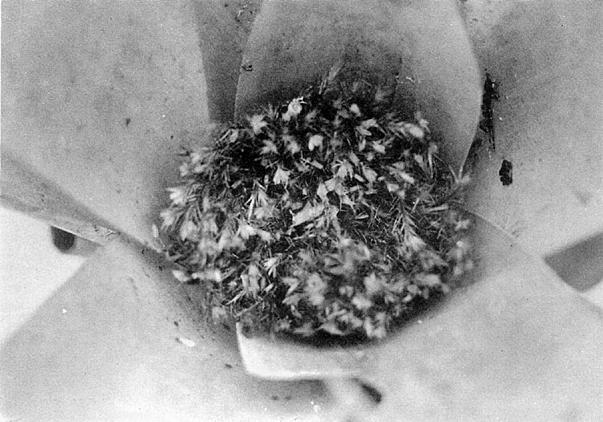 The above photograph showing a closeup of the flowers was made by Michael J. Okie of Fountain Valley, California.